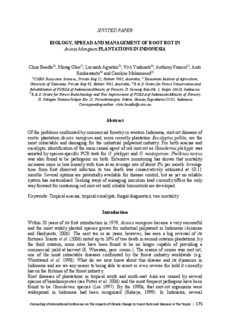 Of the problems confronted by commercial forestry in western Indonesia, root-rot diseases of exotic plantation Acacia mangium and, more recently plantation Eucalyptus pellita, are the most intractable and damaging for the industrial pulpwood industry. For both acacias and eucalypts, identification of the main causal agent of red root-rot as Ganoderma philippii was assisted by species-specific PCR tests for G. philippii and G. mastoporum. Phellinus noxius was also found to be pathogenic on both. Extensive monitoring has shown that mortality increases more or less linearly with time at an average rate of about 3% per month. Average time from first observed infection to tree death was conservatively estimated at 10-11 months. Several options are potentially available for disease control, but as yet no reliable system has materialised. Seeking ways of managing inoculum load currently offers the only way forward for containing red root-rot until reliable biocontrols are developed.